Kudankulam unit 2 has achieved first criticality. India's 22nd nuclear power reactor is expected to be synchronized to the country's southern grid within 30 to 45 days. Construction of the Russian-designed VVER-1000 reactor was completed at the Tamil Nadu site in July 2015, and it was loaded with its first fuel in May 2016. 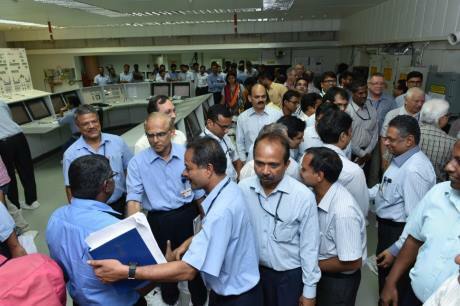 Following the completion of safety tests, Nuclear Power Corporation of India Ltd (NPCIL) began the process of approaching criticality on 8 July by diluting neutron-absorbing boric acid in the primary coolant water. A controlled self-sustaining nuclear fission chain reaction - or criticality - was attained on 10 July at 8:56 pm, NPCIL said. The reactor's power will now be increased in stages, in line with procedural and regulatory requirements. It will be synchronized to the grid when output reaches about 400 MWe. Kudankulam 2 is the second of two AES-92 VVER-1000 reactors supplied by Russia's Atomstroyexport under a Russian-financed contract. The two Kudankulam units have been built by NPCIL and also commissioned and operated by NPCIL under IAEA safeguards, with supervision from Russian specialists. Enriched uranium fuel for the entire life of the plant is to be supplied by Russia. Construction of the Kudankulam units began in 2002. Kudankulam 1 achieved first criticality in mid-2013 and entered commercial operation in December 2014. The Kudankulam units are India's first pressurized water reactors to enter operation and are the largest reactors in the country. With the exception of two boiling water reactors at Tarapur, the rest of India's operating nuclear fleet are pressurized heavy water reactors (PHWR). India currently has four PHWR units and one fast breeder reactor under construction, with plans for construction to begin on over 20 units over the next few years. These could include Westinghouse-designed AP1000 reactors and Areva EPRs as well as Russian VVERs and indigenous PHWR designs. Two further AES-92 VVER-1000s are planned for construction at Kudankulam, with longer-term plans for up to 12 Russian reactors. Earlier this year Russian President Vladimir Putin said negotiations for Kudankulam 3 and 4 were at an advanced stage. India's prime minister, Narendra Modi, welcomed Kudankulam 2's first criticality via Twitter. "Second reactor at Kudankulam became critical yesterday. This is a piece of great news, which makes us happy," he tweeted. "I congratulate the atomic energy scientists, both from Indian and the Russian side for this major technological success," he said.